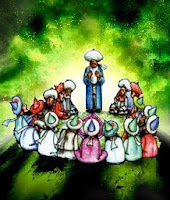 Hosted by Anab Whitehouse, Sufi Reflection Podcast has its latest edition up. [>] Click here to listen / download. credit: Sufi Amanesis | The Sufi Path is a process of amanesis (remembrance, realization). In pre-eternity, God asked the spirits: Alastu bi Rabikum (Am I not your Lord)? When we come into this material existence, we forget about pre-eternity and the task of life is to remember our way back to the truth concerning the nature of our essential relationship with God. This process of remembering or recollecting is known as amanesis.